Japan is a country with more than 100 (!) active volcanoes. The Sakurajima in the Prefecture of Kagoshima is one of them and ranks amongst the most dangerous ones. It used to be an island, but the lava flows of a massive eruption in 1914 connected it to the mainland, creating a peninsula. The volcano explodes several 1000 times a year since 1955. Minor explosions can occur several times throughout the day. Only 4 km of sea separate Sakurajima from Kagoshima City with its more than 500.000 inhabitants. Also, about 4,500 people still live at the feet of the volcano. Inhabitants learned to live with the common ash falls and are aware of the constant danger of another massive eruption within the next years. However, Sakurajima has become the iconic symbol of Kagoshima, and people respect and love “their” landmark. The Sakurajima Ferry Line conveniently connects Kagoshima with Mount Sakurajima. Ferries run 24 hours a day, and the ride from Kagoshima Port to the Sakurajima Ferry Terminal only takes 15 minutes. You have to pay the fare of ¥160 per adult (¥80 for a child) in cash upon exiting the ferry. However, on the way back to Kagoshima, the fee has to be paid already at the Ferry Terminal. There neither is a discount for visitors with disabilities nor is the fare covered by the Japan Rail Pass. Both terminals, as well as the ships, are entirely wheelchair-accessible. Kagoshima Port is within walking/rolling distance of the Tenmonkan shopping district (about 20 min.). Another possibility to get to the port is to take the wheelchair-accessible Kagoshima Cityview Bus. Get off at Kagoshima City Aquarium – the port is right next to it. The ferries offer a wide range of accessible features: Ramps connect the boats to the ferry terminals and guarantee easy access for wheelchair users. There are elevators inside the ships, as well as wheelchair-accessible restrooms. Of course, there are also dedicated sitting areas for wheelchair users. Even the outer decks from where you get fantastic views of the ‘Cherry Blossom Island’ (Jap. sakura = cherry blossom; jima = island) are accessible. If you should be hungry while on the ferry, there is a café and even a tiny ramen restaurant. So, once you made it to the island, you have to decide what to do first. There is much to see! You can take the wheelchair-accessible Sakurajima Island View Bus which stops at all attractions. A day pass costs ¥500. However, I didn’t use this bus, and so I can’t say more about it. It’s just a very short stroll (about 700 m) from the Ferry Terminal to the Visitor Center and Yogan Nagisa Beach Park. ‘Yogan’ is the Japanese word for lava. Visitors can learn about the Sakurajima Volcano and its history in the accessible Visitor Center. The entrance to the exposition is free. The staff puts much love and effort into this nicely made small expo. Also, an about 15-minute long film is projected with impressive material of several massive eruptions. The roaring sound of the blast is unforgettable. Just a few steps away from the Visitor Center you enter the Yogan Nagisa Beach Park with its free foot onsen (Jap. onsen = bath). There are spacious wheelchair-accessible restrooms. The naturally hot water welcomes visitors to sit and relax their feet while enjoying the beautiful scenery. There even is a spot especially for wheelchair users at the foot onsen. This 3-km long seaside lava trail is entirely wheelchair-accessible. You can see the Taisho lava and how nature dealt with it. The path leads to the accessible Karasujima Observatory from where you have a beautiful view of the Sakurajima Volcano. Nature lovers surely won’t be disappointed! There are wheelchair-accessible restrooms at the Karasujima Observatory. There are also two other Sakurajima observatories on the island. An important fact for wheelchair users is that only the Yunohira Observatory is accessible. You can reach the Yunohira Observatory via the Sakurajima Island View Bus. Another one is the Arimura Lava Observatory which unfortunately is only accessible for pedestrians, because of stairs along the trail. 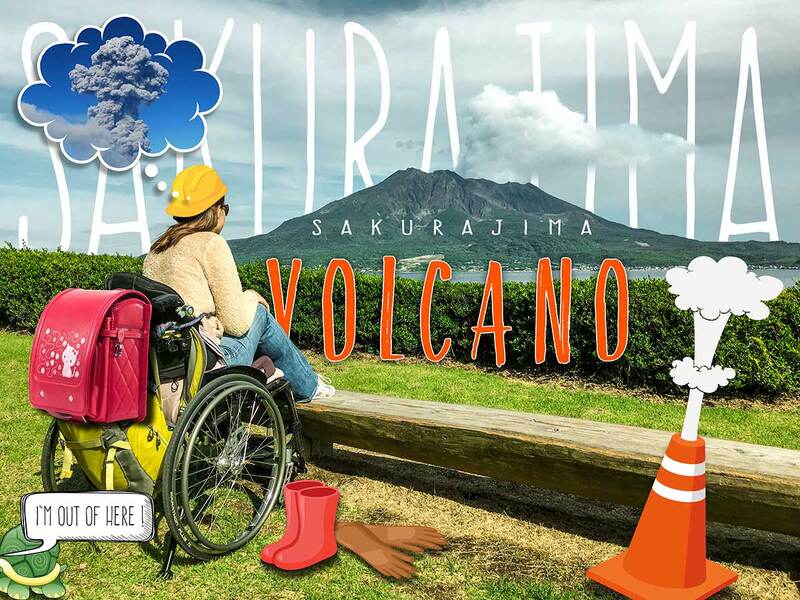 Sakurajima Island’s major sights are wheelchair-accessible. The accessibility of the Sakurajima Ferry Line is excellent and perfectly suits wheelchair users’ needs. Visiting the iconic Volcano is an ideal day-trip when in Kagoshima City! Are you planning a trip to Kagoshima? Have you already been there? Let me know more about your experiences by leaving a comment below! accessible travel adventures on Facebook. So happy to see this post! I found you on Facebook. While I don’t have a wheelchair disability, I use a scooter often, and I’m always looking at destinations to figure out if I can navigate them, how many stairs there are, and if I can use a scooter if I choose to. Great post! D’autres photos plus d’utilité pratique pour montrer aux personnes qui bénéficient d’un fauteuil roulant, n’ont pas à s’en faire pour leur confort dans tous les domaines avec des installations au Top. Bravo Méli, grâce à ton blog, tu souhaites que d’autres profitent de tes expériences en leur rendant leurs voyages faciles. Ta grande générosité est à la hauteur de ta grandeur d’âme. Enter your email address and receive notifications of all new posts! Copyright © 2015 - 2019 littlemissturtle.com All Rights Reserved.